It’s common for friends or colleagues to go out for lunch together and decide to split the bill. One person pays the bill and the others are to send the money through Paytm. Those who do not use Paytm, and use MobiKwik or Oxigen instead, end up withdrawing cash from a nearby ATM to pay their share, or do a bank transfer. This was because you cannot transfer money from one e-wallet to another as of now. This is set to change soon. The Reserve Bank of India has issued guidelines on interoperability of prepaid payment instruments (PPIs) like e-wallets on 16 October, which will enable transfer of money from one e-wallet to another, besides offering other benefits. When the guidelines are implemented by PPIs like e-wallets, you will not need to have multiple accounts with different e-wallets just because a specific service accepts payments only through one e-wallet. For example, earlier, Uber allowed only Paytm as a payment option for those who wished to pay through e-wallets. Similarly, Ola allows only Ola Money to be used for payment through e-wallets. Your e-wallet account will function like a bank account in some ways for digital payments, including having a Rupay or Visa or MasterCard card of its own issued by the e-wallet company. You will be able to transfer funds to any other e-wallet or bank account or make a payment for any service either online or even through point of sale (PoS) terminals or swipe machines at retail outlets. 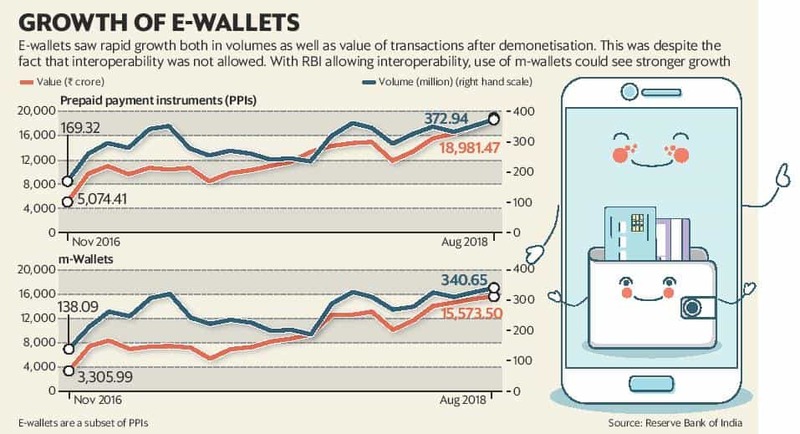 While there are also other forms of PPIs like meal vouchers and gift cards, mobile wallets make 91% of the PPI transaction volume and 82% of the PPI transaction value, according to RBI data for August. However, e-wallet users will have to undergo complete KYC to be able to avail the benefits of interoperability. This means that you will need to submit valid identity and address proofs to your e-wallet operator, to get the benefits of interoperability guidelines. Here are the three main takeaways for an average digital services and digital payments consumer. This is the biggest takeaway for all those who use digital payments. Going forward, you will not be required to use a particular e-wallet just because a cab aggregator has a tie-up with a particular e-wallet company or has their own e-wallet. “Theoretically, you will not need more than one KYC-compliant e-wallet just to avail some service. But in reality, people would still keep more than one, just like debit or credit cards. For acceptance, everyone will be on a level playing field now. What the e-wallets will have to compete for now will be the service quality, special features and maybe some offers," said Navin Surya, chairman, IAMAI’s Fintech Convergence Council. The acceptance of every e-wallet across the ecosystem, seamlessly, the way it happens for debit or credit cards, is the game changing aspect of the recent guidelines, Surya said. This will also mean that a retailer taken on board by one e-wallet company will be able to accept payments from any e-wallet or bank account, using Bharat QR Code or card. This is important because there are about 20 million retail outlets in India, but only about 3 million PoS terminals, a mere 15%, according to experts. The latest RBI guidelines have also enabled prepaid payment instruments, including e-wallets, to join the card networks. While there are over 900 million debit and over 30 million credit cards in India, only about 50-60 million cards are used on e-commerce platforms, said experts. That is mainly because people do not want to expose their bank accounts on the internet, said Sunil Kulkarni, joint managing director at Oxigen Services (India) Pvt. Ltd, an e-wallet and payment solutions company. “The enablement of card issuance by PPIs is a very big step towards enabling a customer to use a card which has a stored value and which can be used just like a debit card. So today if you have ₹ 10,000 in a savings account, you can put ₹ 1,000 in your e-wallet card, and use that card on any online medium as if you are using a debit card. But now the risk is low and you are not exposing your bank account," Kulkarni said. The e-wallet account does not have a repetitive balance coming in automatically each month as it is not a salary bank account. Hence, even if someone ends up compromising the e-wallet card details, the amount at stake will be limited as the card is not directly linked to the bank account. However, one needs to be careful about digital frauds when using e-wallets too. Complete KYC-compliant e-wallet accounts can store up to ₹ 1 lakh at present. You will now be able to transfer money seamlessly from one e-wallet to another e-wallet and bank accounts seamlessly, as payments will happen through UPI. This will facilitate person-to-person remittance effectively, and could be useful in routine scenarios like splitting a bill. Moreover, if you have very little balance lying in different e-wallets at present, you will be able to bring it all together at one place to use it for a larger spend. “Today you have many e-wallets with different balances. These balances are not fungible at present. It is possible that I have ₹ 100 each in my MobiKwik and Oxigen accounts and ₹ 300 in my Ola Money account and I am supposed to pay ₹ 500 for my Ola cab. What I will be able to do now is to transfer all this money to Ola Money and pay," Kulkarni said. For this to happen, you will need to be KYC-compliant on all these accounts. Instead, a person will also be able to save the e-wallet issued card details for these payments like a debit or credit card. The transactions would remain free for now as the enabling system is the UPI. “Wallet to wallet or wallet to bank account transfers both ways will be governed by UPI which is presently free for customers," Kulkarni said. At present, some wallet companies levy a charge for wallet to bank transfers. The guidelines have not dealt with the charges explicitly. But at least initially, in order to retain consumers, e-wallets could keep inter-wallet transactions free, said Khushroo Panthaky, director, Grant Thornton Advisory Pvt Ltd. However, it might still take a few months for these guidelines to be implemented. “The least time can be expected from those who have already been working through bank partners and such companies could take about 3 months. Those who will be starting afresh, may take 6 to 12 months depending upon the size of the organisation and their resources," said Surya. That said, one thing is for sure, that digital payments will see a boost in the near term, along with a lot of ease for consumers.